The human remains detection K9 is trained to locate the scent of human decomposition. The K9 is trained for above ground and buried HRD searches. Although many K9s have the potential to detect human scent, whether dead or alive, the HRD K9 is trained to locate only human remains. The training process may include detection of very minute pieces of human remains, full bodies or even 150-year-old dry human bone. A water search K9 is trained to detect the scent of human decomposition that is in or under the water. 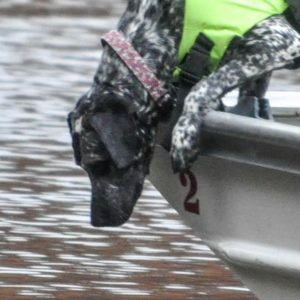 As a team, the handler and the K9 usually work in a boat or along the shoreline. Because of currents and general changes in the water, it can be hard to pinpoint the location of a body. To enhance the chance of location, a diver should be ready to search as soon as the K9 indicates.